Five Motley Fool contributors offer up candidates for a single stock that you should consider adding to your portfolio: GE, Netflix, Amazon, Ellie Mae, and Markel. With thousands of stocks out there, picking a single best investment is not only a tall order to fill but also highly subjective. That being said, we're up to the challenge and five Foolish contributors have picked General Electric (NYSE:GE), Ellie Mae (NYSE:ELLI), Markel (NYSE:MKL), Amazon.com (NASDAQ:AMZN), and Netflix (NASDAQ:NFLX) as their choices. Dan Caplinger (General Electric): The stock market has climbed precipitously in the past couple of months, and many investors have focused on companies that are most likely to benefit from a change in economic priorities in 2017. Conglomerate General Electric is well-positioned to adapt to changing conditions and take advantage of strength in some of its core areas of expertise, and the stock's defensive characteristics should also suit it well in case things don't go as expected in the global macroeconomic and geopolitical realms. General Electric has returned to its industrial roots over the past decade, and that has already paid off with good performance in its aerospace division. Given President-elect Donald Trump's commitment to building up infrastructure, GE should be able to take advantage of opportunities in areas like upgrading the electrical grid and providing power through a variety of generation methods. GE has ambitious goals, looking to nearly double its earnings by 2020. But the company has a path to achieving that goal, and its dividend yield of 3% will also give investors a lucrative stream of income to go with the potential for the stock to rise. Even with markets already having celebrated at the end of the year, General Electric will be a strong stock for the long haul for long-term investors. Brian Feroldi (Ellie Mae): The stock market has been roaring higher since Trump won the U.S. presidential election, but not every company has participated equally. Fears of a spike in interest rates and a rollback in regulation have investors worried that mortgage volumes will dramatically slow in the years ahead. That has sent shares of mortgage software provider Ellie Mae into a tailspin. The company's stock has declined by nearly 20% since the election results were announced, which I think provides investors with a terrific entry price. Ellie Mae's Encompass software has been gaining market share for years thanks to its ease of use and functionality. As of the third quarter, more than 159,500 mortgage professionals were using the company's platform, which was up a strong 18% over the year-ago period. Better yet, revenue per user is climbing at a healthy rate thanks to the continuous rollout of new services. Encompass users can now order credit reports, appraisals, title insurance, and more from the company's platform. When combined, those two trends led to a 46% jump in revenue and a doubling of profits. While Ellie's stock is still trading at a premium valuation, the company looks poised to continue to dominate its industry, even if mortgage origination volume does temporarily dry up. That makes this a great stock to buy now that it is trading at a discount. Steve Symington (Markel Corporation): Markel temporarily pulled back last month after a tough quarter within its medical insurance product lines in the U.S. weighed on its overall results. But as its subsequent rebound indicates, there was nothing so significant in its latest quarterly report to truly negate the status of this so-called "mini-Berkshire Hathaway" as a superior long-term investment. After all, the consolidated combined ratio of Markel's insurance business was still a reasonably strong 98% for the quarter -- which means it earned $2 for every $100 in premiums written. Meanwhile, Markel co-CEO and renowned Chief Investment Officer Tom Gayner remains at the helm of its investment operations, which saw net investment income grow 7% year over year last quarter, driven primarily by higher bond income on Markel's fixed maturity portfolio. And keeping in mind equity securities still only comprise around 23% of Markel's enviable portfolio, you can be sure Gayner will only continue to implement his proven strategy of buying shares of high-quality stocks with a long-term mindset. "In general, we hope to be able to buy a stock and never sell it," Gayner has previously told investors. "I think that if you limit your buying to things you will be able to own for a long time, you will put more thought into whether to buy it or not and that leads to better long-term decisions." On top of that -- and also similar to Berkshire -- Gayner is steadily building a portfolio of solid non-insurance businesses through Markel Ventures, where quarterly revenue most recently climbed 7.4% year over year, to $321.3 million, with the help of Markel's acquisition of IT consulting company CapTech a year ago. All told, this three-pronged approach at consistently generating shareholder value has proven exceedingly effective; shares have more than doubled over the past five years alone, and have averaged 16% annualized returns since Markel's IPO in 1986. But with shares currently trading at an attractive 1.48 times Markel's book value as of Sept. 30, 2016, I think now is a great time to consider opening or adding to a position in Markel stock. Jamal Carnette (Amazon.com): As much as I eschew superlatives when it comes to investing, the company that best fits the description "best" is Amazon.com. BBY market cap data by YCharts. Since June 2009, the official end to the Great Recession, Amazon has grown its market capitalization more than 900% while most other retailers have failed to match the S&P 500's performance. Furthermore, it's noteworthy that the two retailers that have grown their market capitalizations at a higher rate than the S&P 500, Home Depot and Costco, mainly traffic in bulky, hard-to-ship products (Home Depot), have a membership model (Costco), or both (Costco). Retailers of price-sensitive, easily shippable goods (Best Buy and Abercrombie & Fitch) have fared poorly during the recovery. 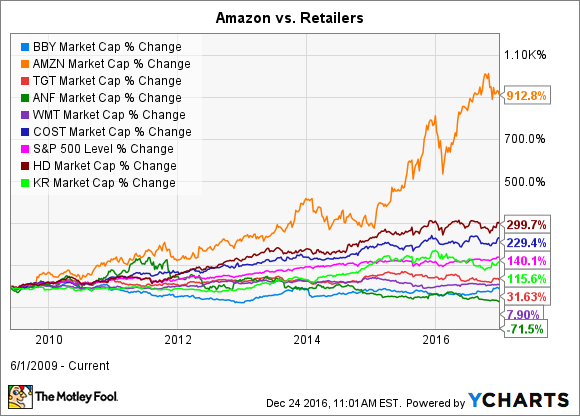 Therefore, Occam's Razor dictates Amazon has stolen market share from other retailers as the growth of e-commerce continues. Even better, the shift to e-commerce is only in the initial stages -- last quarter only 8.4% of all U.S. retail sales were e-commerce; marketing analytics firm eMarketer estimates this figure to increase to 14.6% by 2020. Simply put, Amazon has a large runway for growth even if retail continues its lackluster recovery. The knock against Amazon has always been that the company has struggled with profitability. However, the company has put together a string of profitable quarters on the back of its Amazon Web Services division. Throughout the first nine months of fiscal 2016, AWS has provided roughly 9.4% of Amazon's total revenue but 42.4% of its operating income. Even better for investors, AWS is growing at a 59% year-over-year clip, more than double the rate of Amazon's 29% during the same time frame. Look for it to continue to grow its bottom line as AWS grows and the company keeps gobbling up retail market share. Evan Niu, CFA (Netflix): With astronomical valuation multiples, Netflix isn't for the faint of heart. But the dominant online video streamer has carved out such an irreplaceable place for itself within home entertainment and popular culture that it should be clear that Netflix is here to stay. The company has built a remarkably resilient member base within the U.S., where churn rates have stabilized since the U.S. is Netflix's most mature market. I would say we're having broad success around international. We're continuing to make those investments. We've got a lot of room to go to improve the service. We mentioned in the letter that we've only just now localized Poland and Turkey. That brings us up to 22 languages; YouTube is at 50, so we've got a long way to go in that localization effort. From a financial perspective, Netflix still loses money with its international operations, but the good news is that the core U.S. business easily subsidizes those long-term investments. Last quarter, the U.S. brought in a contribution profit of $475 million, while international streaming lost $69 million. While Netflix has decimated the broader market over the past five years, I think the company still has plenty of room to run over the next five to 10 years.